Today you enter two days of walking around the golden beaches and towering cliffs that make up St Austell Bay. Leaving Mevagissey harbour you climb Penare Point passing the overgrown ruins of the old pilchard cellars all that is left of the abandoned hamlet at Portgiskey. The village of Pentewan is the only place with facilities on today's walk at The Ship Inn and the Pixie Cove Cream Tea Shop. Having crossed the golden sands at Pentewan Bay the village makes for an interesting distraction from the coastline with its inland harbour built in the 18C now marooned from the sea after shifting sands blocked the channel. 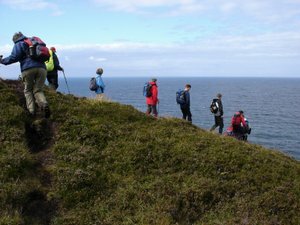 Your route now enters very dramatic, cliff and cove walking as you start an ascent to the rugged Black Head Promontory site of a former Iron Age cliff castle and with stunning views across the Bay you can see why. The little beach at Halane makes an excellent lunch stop on the way up with its refreshing waterfall crashing to the sands behind a window rock arch. Heading inland now towards the back of St Austell Bay the walking takes you through the Cornwall Wildlife Trust Nature Reserve at mighty Ropehaven cliffs through a memorable descent/ascent back to sea level at Silvermine Point passing the natural rock arch at Phoebe's Point. 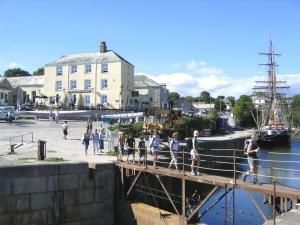 The day ends with a return to habitation at the historical harbour at Charlestown where you will spend the night in the peaceful company of the harbours tall ships.